The Military Service Bill led to one of the most angry confrontations between French and English in Canada's history. It's known as the conscription: the compulsory enlistment of men into the armed services by an act of law.conscription crisis. Early in the war, volunteers were numerous and people expected the war to end soon. By 1917, however, soldiers were still slogging in the trenches with no end in sight. Voluntary service was no longer able to maintain the level of troops we needed overseas (500,000 with 80,000 continually at the front). Prime Minister Robert Borden tried to persuade the leader of the opposition, Sir Wilfrid Laurier, to join him in supporting conscription, but the French Canadian former prime minister, after much soul searching, decided to remain on the anti-conscription side. His hesitation had been lambasted by Henri Bourassa, a fellow Quebec Liberal and founder of the influential newspaper, Le Devoir. Bourassa had been a vigorous campaigner against conscription. 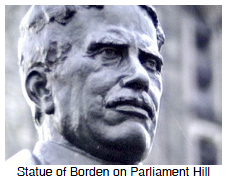 When Borden brought in the bill in July 1917 the reaction in Quebec was furious. 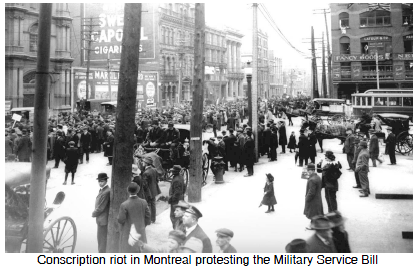 There were riots in the streets and when they tried to enforce conscription early in 1918, more riots and deaths followed.